Urban Camouflage deals with the question how to camouflage oneself and one’s identity in the urban space. Our costumes are inspired by the «ghillie suits», the military camouflage suit. It was an adventure to wear the suit in the stores because of the conflicts with the employees , the reaction of the customers and also to see the pretty well camouflage effect in a real situation. hahaha. though, it would’ve been pretty scary for people who were just walking by! 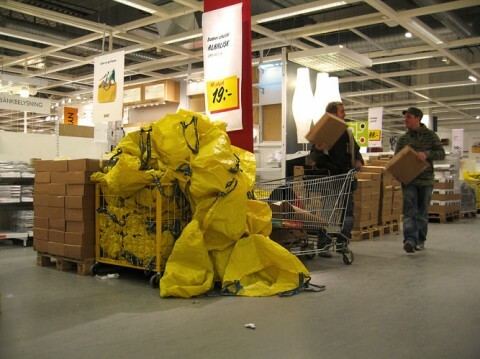 man ikea looks the the same all over the world!! this pic could also be taken in the one around the corner here in germany..